L. teyrovskyi adult in Africa. Physical description: About 8 to 12 mm in length. Often brachypterous. Dorsal side is brown or reddish brown and head is dark brown to black. Pronotum is short and posteriorly broad with a center line that runs through it. 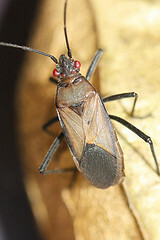 Scutellum is dark and broad with a light tip. Hemelytra have dark brown lateral borders. Ventral side is similarly colored to dorsal side except for dark head. Appendages are dark brown.